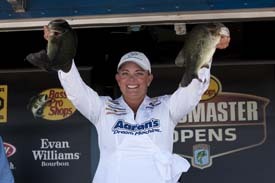 Janet Parker fell short of her quest for a 2012 Bassmaster Elite Series berth. Janet Parker has fallen out of contention for a Bassmaster Elite Series berth in 2012. The bass pro from Little Elm, Texas, finished in 100th place in the Bass Pro Shops Bassmaster Central Open on Table Rock Lake, knocking her out of the top five in the circuit's points race. She was aiming to garner a top-5 invitation to turn Elite and become the first female Elite pro in the sport's history. "I fished as hard as I could, tried the best that I could," said Parker, who had entered the tournament in second place in points. "I used everything in my bag of tricks. I'm disappointed in the outcome, but I'm not disappointed in myself because I gave it my best shot." She wasn't ready to declare she'd try again for an Elite berth. "I think I'd better wait until I've 'hibernated' for a week to make that decision," she said, referring to her habit of taking it easy for a few days after a grueling tournament schedule. "And I'll wait and see what happens." She meant that over the next few months, if any of the five Central pros decline their Elite invitation, she could get a call as B.A.S.S. works down the Open points list to offer the spot to other Central pros. Her two-day total at Table Rock was 2 pounds, 5 ounces. She zeroed on Friday after bringing one largemouth to the scales Thursday. "One thing was that the shad had moved out, and I wasn't graphing fish in my areas like I had been," she said back at the dock on Friday. "The changing weather conditions were a big factor for me. The Table Rock bass don't read Bassmaster Magazine - they truly do not behave typically. I didn't adjust like I should have. I still don't have them figured out." Her 100th-place finish earned 76 points. That gave her a three-tournament points total of 612, 20th place in points. The points standings will be final only after the Table Rock competition concludes Saturday. The 12 pros who made the cut to compete Saturday could raise or lower Parker's placement on the points list slightly, but she could not recoup a top-five position. Parker has captured the attention of the media and the public during her bid to be Elite. She said she's enjoyed the chance to be a role model to women and girls who are interested in fishing. "One lady came up to me in the crowd and told me she'd just joined a bass club." Parker related. "She said some really nice things to me. That meant a lot to me. If I can show just one woman that she can do it, or one dad that his little girl can be his fishing buddy too, then I'm good with that as my accomplishment this week. "This has been an incredible journey and season this year. I feel very fortunate to have had this opportunity. Hopefully I'll get this opportunity again. I thank everybody who has been wishing me well, sending me positive thoughts. I owe thanks to my sponsors, to my family, and to B.A.S.S."